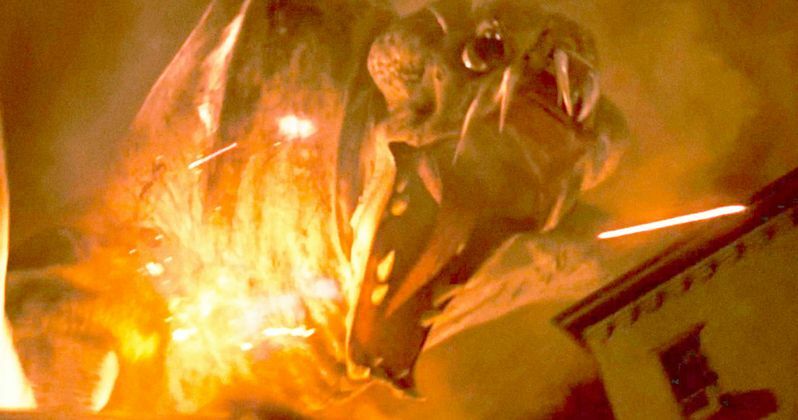 We finally know where the monsters in the Cloverfield universe come from. Netflix decided to surprise us all and release Cloverfield 3, officially titled The Cloverfield Paradox, right after the Super Bowl last night. The streaming service acquired the movie from Paramount just recently and didn't waste any time in allowing their audience to view it, pretty much avoiding a promotional campaign entirely, save for one ad placed during the big game. And this movie finally answers the question of how the monsters in Cloverfield came to be. Warning: spoilers ahead for The Cloverfield Paradox. As one might expect, this movie doesn't lay it all out on a silver platter and there are still plenty of questions to be answered, but we know that the monsters are the result of an inter-dimensional crossover. The plot of Cloverfield 3 sees a crew of astronauts aboard a space station who are trying to solve the Earth's very dangerous energy crisis. In the year 2028, they manage to accomplish this, or so they think, by powering up a massive particle accelerator aboard the station. However, this goes south and it's revealed that they actually wind up traveling to another dimension. This leads to some very strange issues, like the worms on the ship disappearing and reappearing inside the body of one of the astronauts, and a strange, unfamiliar astronaut being found inside the wall of the space station, among other things. This is all the result of crossover between at least two dimensions and, while it doesn't explain precisely where the monsters come from, we know they are the result of this science experiment gone wrong. This is the result of what is called The Cloverfield Paradox in the movie, as explained by Donal Logue's character Mark Stambler toward the beginning of the movie. "That accelerator is 1000 times more powerful than any ever built. Every time they test it, they risk ripping open the membrane of space-time, smashing together multiple dimensions, shattering reality. And not just on that station, everywhere. This experiment could unleash chaos the likes of which we have never seen. Monsters, demons, beasts from the sea... And not just here and now. In the past, in the future, in other dimensions." At the end of the movie, Ava (Gugu Mbatha-Raw) is making her way back to the original Earth with Schmidt (Daniel Brühl), as the only surviving members of the crew. However, her husband Michael (Roger Davies) has been on Earth enduring an attack and tries to warn the powers that be to not allow her to return home. As their escape craft enters the Earth's atmosphere, the final shot of the movie sees a gigantic monster, very similar to the one from the first Cloverfield, only much, much bigger, popping up through the clouds. This signals that such monsters are attacking all over the planet as a result of the interdimensional ripple created by the particle accelerator. The big problem, or at least question that's left very open from this, is that this event is happening on Earth in 2028, as far as we can tell. So how does that explain the Cloverfield monster from the first movie, which takes place in Manhattan in 2008? As Mark Stambler explains in the above quote, it can effect the 'past, in the future, in other dimensions'. Which may go onto explain how and why Cloverfield 4 takes place in WWII. We know this all results from this particle accelerator incident and not some government creation gone wrong, but we've still got questions. What other dimensions were affected by this experiment? And where/when does 10 Cloverfield Lane take place in all of this? Perhaps Cloverfield 4, which is said to be arriving later this year, will provide even more answers. The Cloverfield Paradox is currently streaming on Netflix.